There are 8 locations / missions in the LEGO Ninjago Movie game. After beating the game you’ll go to a mini level where you play 2 mega figures and just rampage around the city. Once you hit 100% it will end and you’ll get 3 characters and a Gold Brick. In Uncrossable Forest Cole will earn the Destroy cracked LEGO objects. This is his Spinjitzu ability and unlocks the achievements. There are 101 characters to unlock this time. Please note that using any of the promo codes to get characters early appears to void the achievement. Look for the Tornado symbol on the map. There are usually 3 per location and they cost around 100 to 300K each. In Ninjago City North you’ll come to the school where you have the help the teacher get the students to go back to school. Run up the right wall and then use the jump bars to get to the far side of the roof. From there push the object to the ground. Build it and have Cole hit it setting off the bell. This will open the school and unlock the Character Creator. Head into the school and use a locker to make a character. Simply Save and Exit to get the achievement. In past TT LEGO games there were individual stud goals per level. In LEGO Ninjago Movie Game there are now 20 levels to obtain and studs had to your overall levels. You unlock a Gold Brick and custom character items at each level. Ninjanuity Tokens are earned during the main story missions and are used to unlock upgrades for combat. You’ll get the final token needed in the final mission. This will also reward you a Ancient Scroll. After beating the 2nd main mission at the Beach the terminals to play Battle Arena will be available. There are 3 modes. Samurai Showdown, Mystic Bounty, and Ultimate Ultimate Weapon. There a total of 5 powerups to find in various game modes. They don’t appear to have names but make sure you use each of them. Fireballs, Giant Kitty, Speed Smoke, Disco and the Lion. You’ll get Kai (Classic) as you play through Ninjago City North which is the first main mission. As soon as the mission is done you’ll go into Free Play mode. Open the wheel and go to the Free Play (at the bottom) in the wheel. Characters don’t cost money so just select Kai (Classic) as one of your character and select Kai and the achievement will unlock. I can’t, and won’t, call this a proper review. The fact of the matter is that Troll and I is so so so so so (let’s just call it so to the 9,000th power) bad that I couldn’t even get past 10 minutes of the game. Characters shuttering around as they “walk”. The main character has dreads, dreads that are self contained inside their own ecosystem with wind speeds that seem to be at least a factor of 80 past the rest of the world’s wind. The first action sequence is a running “game” where fire is chasing you so you have to navigate a pathway with obstacles. Let’s go over the 4 separate glitches I encountered on this one sequence alone. Number 1. The first time it loaded it actually loaded me into a village area where I was simply running straight through the houses and other building like they weren’t even there. Number 2. After reloading the first time the game never came back. It just froze at the loading screen. Number 3. When I finally got running the prompts for the obstacles started happening later and later. It got to the point after only a few jumps that prompts were happening AFTER I passed the obstacle. Lucky for me the design is so terrible that ALL the prompts were B. Number 4. After getting about halfway through the scene the camera rotated and ran my man directly into the side of the rock wall allowing the fire to overtake me. And I tried to recreate this thinking I just forced him that way but you don’t have the much control over the character. That was all in just one sequence. Two cutscenes, a boar hunting mission and this run mission was all I could stand. At least Goat Simulator was only $10 and had the decency to tell you ahead of time what you were getting into. 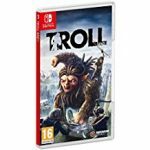 Troll and I is just plain absurd at $50 and frankly Maximum Games should be ashamed of themselves for even releasing it.